I am trying to used words and analogies that people understand and can visualize. you wrapped it up all in 3-4 lines...nice! No flow? You might as well say that there are tiny invisible arms that come out of a magnetic pole and grab materials that are susceptible. Hmm...an area where stuff happens, then a magical area of mystery. A field is simple..... Its an Ether (inertia, counterspace, zero point.. blah blah, diff names, same thing......the scumsuckers of the cult of quantum call it "dark matter") modality perturbation. A FIELD is an Ether perturbation. Nothing EMITS a field anymore so than a person in a pond flapping their arms is EMITTING anything, they disturb the field (in this case the calm waters) . Last edited by TheoriaApophasis; 05-29-2018 at 11:23 PM. me try wrap it up also in few words with a riddle. There is balloon full with water. Someone is doing a small tear with a knife in the balloon. Water pours out of the balloon. Last edited by Markoul; 05-29-2018 at 11:45 PM. dielectricity is the "space eraser"
electrostatic "cling" , is the SAME THING that us dumb humans call "gravity"
and is the SAME THING us dumb humans call "magnetic attraction"
paper clips "jumping to" a magnet is only the field inducement of a ferromagnetic object(S) to accelerate to the lowest pressure field state, which is CLOSEST proximity BETWEEN the magnet and the clips. You pick a brick up off the floor. Do you see any flow? See any little arms grabbing the brick? Yet would you agree that brick is in a gravitional field and if you drop it, action happens due to the field and the disruption you caused by displacing the brick? You move a piece of steel into a strong magnetic field holding near but not touching the magnet. There is no flow. But when you release your grip, the steel piece moves toward the magnet. Can you understand how things like those examples work with no flow? If not, then make up some little particles or energies like gravitons or virtual photons. Whatever works for you. Lots of people; lots of opinions. Latest great video from Mike! I don't think Hall sensor magnetometers care about ejecting flux lines or seeking flux lines they just need to measure the flux density (number of lines passing through per unit of 2D surface). The measure the magnetic energy per unit surface (density) by using the Hall effect of a electric conductor with an electric current flowing through. Hall effect or Hall voltage is a consequence of the Lorentz force when a magnetic field is nearby an electric current flow inside a conductor surface. Not really so much different from the crt electron beam deflected by a magnet but this time with a solid electric conductor. After consideration I concluded that the above pump (fountain) model you depict can not be true. Because for the observer facing a pole of a magnet, he/she will see exatly the same picture and rotation in both poles of the magnet! So where is the counter geometry and counter rotation flow in your magnet responsible for the N and S polarity of a dipole magnet? We all know there is a difference between N and S pole for an observer (by observer I don't mean necessaserely our eyes, could be as well an other magnet or a crt electron beam). You can not deny this. Poles maybe in essence the same thing x2 but their counter orientation in space produces their counter rotational flux. If they were exactly the same in rotation for an observer top view, a crt beam would NOT deflect different according to what magnetic polarity we are approaching? Right? North-South are just ONE SINGLE SPIN, ONE DIRECTION. Last edited by Ufopolitics; 05-30-2018 at 01:11 PM. yes of course it is the same with my pc fan analogy turn it over and air flow direction will change, reverse the skew angle of the fins and the air flow will reverse for the the same direction of rotation of the fan. All what i am saying is that this is not showing up in your diagram. I could have sworn I posted something yesterday, but I don't see it here now. Please don't make this a thread about magnetism. It's about the cell. Seeing and describing the visual effects of the cell is one thing, but don't forget the opposite is true- you can use the cell and magnetism to control the direction of light ! What happens when you shine light thru a grid of slits?" I'll extent this question to include cylinders. Lets assume these cylinders are 150 to 200 um in length. Start by reading this. Even if you don't get the math, the graphics are good. After you read it, remember they are basing their results on fixed-substrate grids. The 'grids' in a cell are dynamic and in motion. Instead of their fixed, simple cylinders, the cell makes dual-helix cylinder-shaped thingies that are in motion. I liked the way Michael presented in his paper. And I also liked this one. ps. I think part of the problem regarding this topic is the attempt, by some, to prove, or at least show, that the ferrocell depicts the magnetic field when there is no agreement on the definition of magnetic field amongst members here. This research has been going on for many years, and we're sloooowly getting somewhere. The cell is showing us the effect of a magnetic field on moving, micron-sized, twisted cylinders with light passing thru them. There are not solid answers yet. The mechanisms responsible are still debatable and open for discussion. That's why I'm here ! There is nothing really more to prove here. Mike's microscopy video sealed the deal. You have little nanoparticles lines, needlles witch work in unison and align with an extrnal magnetic field applied flux and are ****ing reflective to the omnidirectional light when they get polarized by the field lighting it up like a christmas tree and making it visible! Thus the lines you see on the ferrocell ARE THE MAGNETIC FIELD LINES OR ELSE FLUX OF THIS FIELD! Ferrocell is 100% correctly and accurately showing the visible image of a magnetic field. Reflection is the dominant light effect here. All other possible light effects are minor and little to nothing contribute to the end result. I told you before, Faraday never doubted his iron filings experiment and used it to describe magnetism. So now after 200years an new guy came on the blog to replace grandpa iron filings thus the ferrocell and he is ****ing amazing. It is not the ferrocell which is wrong BUT the 200 years classical image of a dipole magnetic field iron filings imprint we had in our brain plugged in all this time. Well, it is time to show the world the real thing using your God given invention. We are writing history. I am not taking for given that the classical magnetic field picture is correct and try to explain what the ferrocell is showing and why it is showing it that way? But rather the fact the ferrocell is showing the correct 2D compressed image of a magnetic field and try to understand from there what the magnetic field would look in 3D Euclidian space. The debate is over for me. And yes if it's imitating 100% accurately a duck since I am not interested in eating just looking at, as far as I am concerned it is the duck. some sidenotes: I think Mike did not use a double microscope slide with the ferrofluid in between. Just a drop on a single slide. If he would had used a double slide that would be perfect since it would emulate the strong Van der Waals forces in a ferrocell and we would not observe any Brownian motion and gravity related motions in the fluid. Last edited by Markoul; 05-30-2018 at 05:52 PM. I'm certain there is more to this than light reflecting off the particle chains. An activated cell (magnetism and light) is experiencing a lot more than reflection. If you do not want to recognize there are much more phenomenon happening that is your prerogative. If you are sure you know, then good for you. I'm not convinced we are done here. Dig deeper into how light reacts when it encounters a tiny diamagnetic object. You will find many reactions at work, besides scattering. I do, however agree with your point of view about Ferrocell vs iron filings. In order to get traction in this area, we need to present it in such a way that first-time readers aren't shocked and offended by this theory. To blatantly state 'the Ferrocell shows the true magnetic field' will have to be watered down and palatable for the scientific community. You can say anything you want here, but scientists aren't even going to read past the title. Trust me on this. I've been trying since 2004 to get anyone in the science arena's attention. Presentation is everything. And a side-note about the fluid. A container of EFH1 ferrofluid will not settle over time due to Brownian motion and the Van Der Waals effect. Likewise, gravity has no effect on the individual particles, but only on the entire mass collectively. The coating (surfactant) on the nanoparticles provide the steric values necessary to keep them apart (it's their cute little tails). From wiki: "These surfactants prevent the nanoparticles from clumping together, ensuring that the particles do not form aggregates that become too heavy to be held in suspension by Brownian motion. The magnetic particles in an ideal ferrofluid do not settle out, even when exposed to a strong magnetic, or gravitational field. A surfactant has a polar head and non-polar tail (or vice versa), one of which adsorbs to a nanoparticle, while the non-polar tail (or polar head) sticks out into the carrier medium, forming an inverse or regular micelle, respectively, around the particle. Electrostatic repulsion then prevents agglomeration of the particles." NOW, when Brian adds mousemilk to the mix, he is changing the colloid's fluid density by including an oil with a much lower viscosity than mineral oil (the colloidal in EFH1). The result is a brighter display and obviously a faster response time. Both of these changes are a direct result of lower viscosity and smaller particle size. Thus the lines you see on the ferrocell ARE THE MAGNETIC FIELD LINES OR ELSE FLUX OF THIS FIELD! nahhhh, thats half the story. the lines you see and the DARK PARTS you dont see are no diff than the so-called "lines of force" sen using ferrofluid in a VIAL where you see SPIKES and "anti spikes"
also no diff than constructive and destructive interferences from the "double slit experiment"
There is only one way to tell for sure. Put a strong magnet close to the ferrocell on top, leave the ferrocell open and measure any voltage across it's surface of the thin film. Even if it's so, I find it hard any electrostatic net effect to produce a voltage high enough to initiate an measurable significant ion current. But again I could be wrong. "Unveil the true nature of magnetism"
There is balloon full with water. Someone is doing a small tear with a knife on the balloon. Water pours out of the balloon. p.s. the first who solves the riddle wins a one night stand with the mother****er!...eeeh! I meant wins the knife. Last edited by Markoul; 05-30-2018 at 08:57 PM. But if you give a hammer and chisel to an artisan, he might carve out a masterpiece in wood or stone fit for a museum worth millions. if you show a FERROCELL to a knuckle dragging retard , hell just say. "SO!!!!! hows this gonna get me RICH OR LAID !??!?!?!?!?!!?!?" The “lines of force” is a nonsense concept and came from Faraday in viewing iron filings above a magnet. The lines are due to constructive and destructive pressure mediation between divergence and convergence of the magneto-dielectric, namely the re-integrating dielectric. There are no lines, and force is qualified as the action of one thing upon another. The presumed magnetic “lines of force” are ether wake-fronts, both 2-dimensionally circular and extrapolatively curvilinear (to the mass). These endless wake fronts are the genesis of magnitude which begins the measure of same, so conceptualized as time. Interference observed in the double slit experiment is the exact same thing…..however contrary to mathematicians (falsely paraded as scientists) there are no WAVES of light, since a wave is not a thing, NOR is light a damn particle. There are many ways to tell for sure, but leaving a cell open and using a meter to measure voltage will not work. It's a process that requires the cell to be free of atmosphere and contained within it's own boundaries. The particles create stresses when influenced by the field and these stresses lead to positive pressures inside the cell. Look at an open dish of ferrofluid with a magnet is sitting under it. What I'm referring to is a jump in energy. With a magnetic field and light, the particles (with the surfactant) go into a another energy state and while excited, kick out an electron (sorry Ken). It's almost impossible to measure, but a good electron microscope could do it. (yea Ken, I know). This is a feature of electrostatic potential from dielectrics. kick out an electron (sorry Ken). On the whole subject of matter, in fact, Dr. Tesla holds views that are startlingly original. He disagrees with the accepted atomic theory of matter, and does not believe in the existence of an “electron” as pictured by science. Also consider the J.J. Thomson concept of the "electron" (his own discovery). Thomson considered the electron the terminal end of one unit line of dielectric induction. Really, my views on the electron are somewhere inbetween Tesla and status-quo. Calling it an electron allows me to communicate with other members of the scientific community. If I call is something else, the conversation ends. I don't subscribe to the 'billiard-ball' concept at all. It's hard to pinpoint a spinning vortex of energy but they can be localized and measured. Simply stated: A difference of potential (dielectric) is where they come from and their flow (current) is what connects them together. There is always hope for a paradigm shift in magnetism. 1) Gauss meters using a Hall sensor are meausing the vertical part of the flux hitting the sensor and not so much the horizontal part of the flux of a magnet. In other words Gauss meters are measuring more at the Z-axis direction. 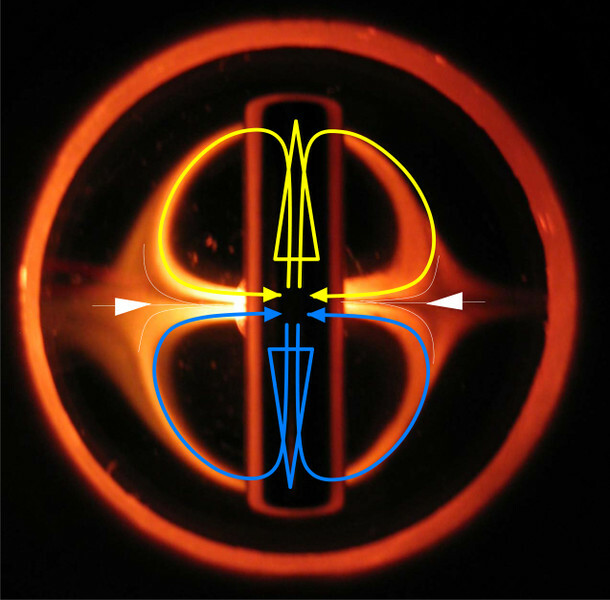 2) The flux in the Bloch axis of a magnet is squeezed all in a tiny almost 2D plane, therefore flux density is enormous at the middle of a magnet coming from both poles. However, again Gauss meter are designed to measure flux density per a specific and constant surface, thus for example say one square cm. If flux squeezed below that minimum surface area it will not be registered by the meter. On the other hand, a ferrocell because its nanoparticles are free to move at any direction (6 Dof) is picking up magnetic flux from any direction and has no problem to register and depict the field of a magnet at the middle Bloch region when a magnet is put on its side on the ferrocell. Finally the reason why Brian is picking up distance wise with the ferrocell first the side field of a magnet and not the poles field is I believe because the geometry of the dipole field consisisting of two torus making up a squezzed sphere meaning the net spherical field is geometricaly more wide and extending more into space at the equator than the poles. p.s. a very sensitive xyz 3-axis magnetometer instaed of a Gauss meter, located at the middle of a magnet and designed to measure at very small areas say on square mm should confirm my above theory. Last edited by Markoul; 06-02-2018 at 05:17 PM.